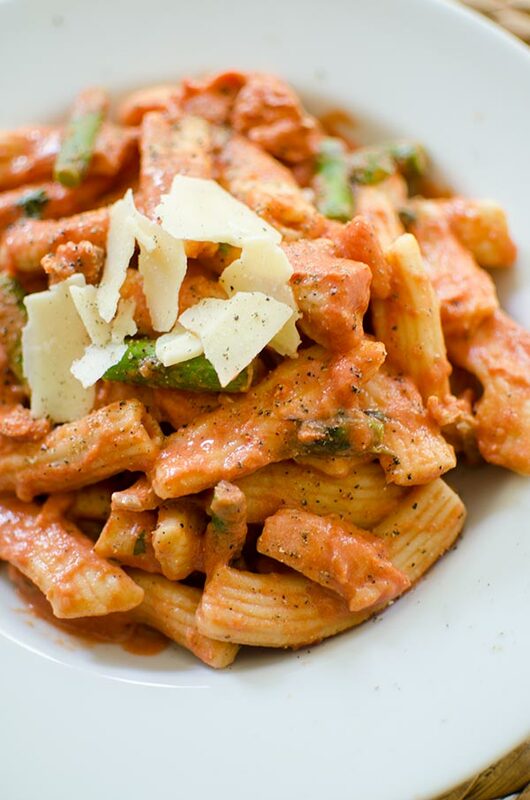 A delicious pasta with salmon and asparagus in a creamy rose sauce topped with Parmesan. I love to go to restaurants and try all sorts of dishes as research, analyzing each bite for flavours and textures. 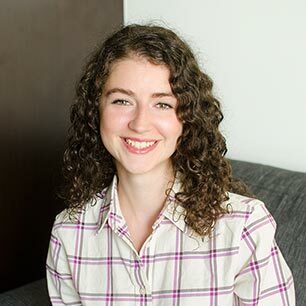 You never know when you might pick up on something, whether it be an ingredient or flavour combination that will eventually make it into my kitchen and then the pages of this food blog. Every now and then during my research (it’s pretty fabulous research, is it not?) I find that I’ll have a meal that is so impeccable, you can’t help but dream about it. This homemade pasta is an example of one of those special meals. And now that I’ve fallen in love with my Philips Pasta Maker (see my recipe for homemade pasta with chicken and fresh herbs,) I knew it was the perfect time to recreate this pasta recipe. This pasta with salmon and asparagus is an example of one of those dishes that was sparked by a meal I had at a well-loved restaurant in Toronto called Sotto Sotto. It was a house-made pasta with a creamy rose sauce, local Ontario asparagus and bites of perfectly cooked salmon woven throughout the dish. Oh my gosh, was this dish ever delicious! I wanted to try out one of the shaping discs (the Philips Pasta Maker comes with multiple discs for lasagna, spaghetti and short shapes like rigatoni and penne, which can be stored within the smart storage space at the bottom of the machine). And for this this creamy pasta, I opted for my favourite shape, rigatoni. It starts by adding the flour to the machine and then slowly pouring in the liquid (water + egg). Once the three ingredients are added, the machine does all the work! Within three minutes, you’ll see pasta coming out of the machine, and all you have to do is cut the noodles to your desired length. It took me a couple of snips to get the perfect length, but before I knew it (literally within 15 minutes), I had a pound of fresh pasta cooking on my stovetop. I like to start a pot of water (and don’t forget to add salt to flavour the pasta) on the stovetop before I start making the pasta. That way it’s ready to go right when my pasta is. I love how homemade pasta has that rustic, homey vibe–it reminds me of the endless bowls of pasta I enjoyed in Italy last summer. 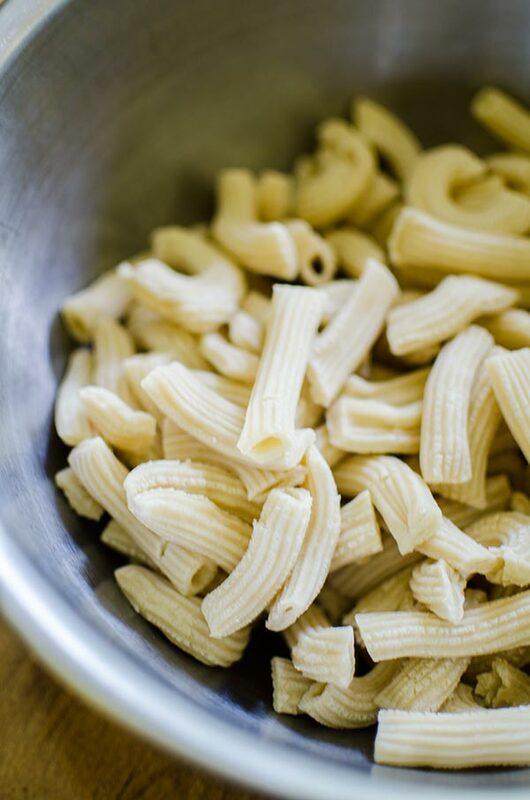 June is actually Italian Heritage Month – a celebration of all things Italian in Canada – which seems like the perfect reason to whip up a quick batch of homemade pasta. 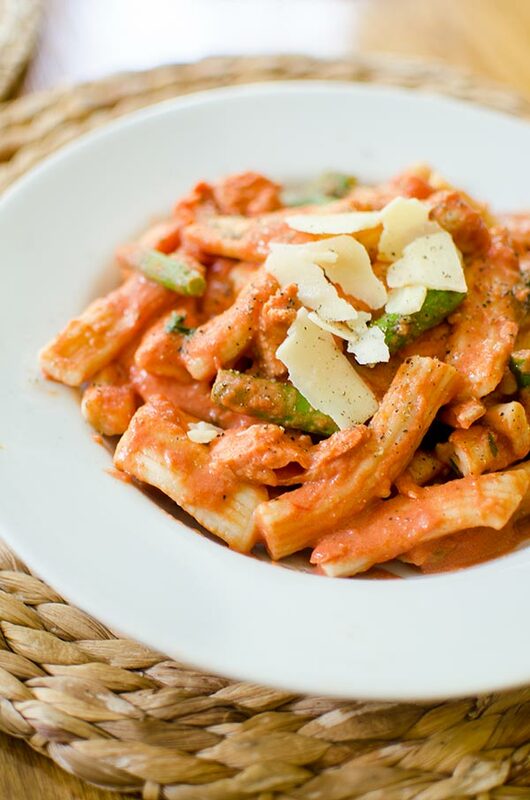 Let me know if you give this pasta with salmon and asparagus a try in the comments below! 1. Open lid and add flour Close lid and turn on appliance. Select program 2 and press start. Once machine is running, slowly pour in liquid through opening on lid. Pasta will appear after approximately 3 minutes. Cut to desired length and toss with a small amount of flour. Cook in a large pot of salted water for 10-12 minutes. 2. Meanwhile, in a large sauté pan, heat 1 tbsp of butter over medium heat. Add asparagus, season with ¼ tsp of salt. Cook, stirring until asparagus is bright green and tender-crisp, about 5-7 minutes. Remove from pan and set asparagus aside. 3. Add another tbsp. of butter, season salmon with ¼ tsp of salt, add salmon, and cook for 4 minutes, flip and cook another 3 to 5 minutes or until light pink throughout. Remove from pan and set aside, flake with a fork. 4. Add remaining butter to pan with garlic and tomato paste. Cook, stirring frequently for 30 seconds to one minute. Add crushed tomatoes, and remaining ½ tsp of salt. Cover, reduce heat to low, and cook stirring occasionally for 15 minutes. Stir in cream, fresh basil and sugar. 5. Add pasta, asparagus and salmon to pan with sauce. Serve with additional basil and freshly grated parmesan cheese. Disclosure: This post was sponsored by Philips Canada– as always, all opinions are my own. Thank you for supporting my sponsors and allowing me to continue creating recipes like this pasta with salmon and asparagus. 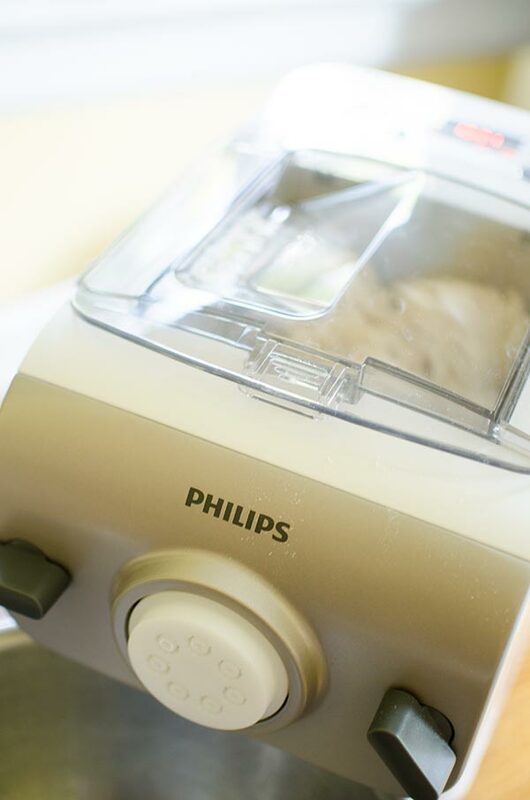 This pasta dish sounds soooo delicious & I love that you made it with your very own Phillips pasta machine which would make the pasta soooo tender! Love your photos, too!